In 1987, the throat-grabbing brilliance of Wall Street caught the zeitgeist with Gordon Gecko’s motto that “greed is good”. That was a very different corporate America, arrogantly confident and on the up and up. 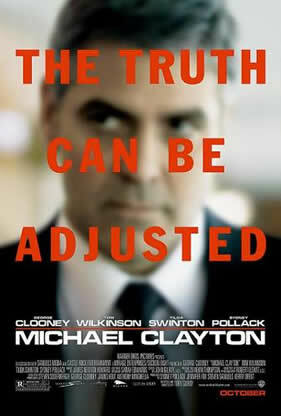 What Michael Clayton successfully captures is the daily grind of corruption and decay in the land of Enron, Haliburton and Blackwater. Today’s zeitgeist is summed up by a recent poll showing that only 21% of Americans believe the country is on the right track, and two thirds think its best days are behind it. 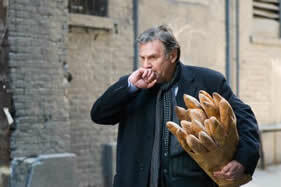 It is hard to put one’s finger on why Michael Clayton does not quite live up to George Clooney’s other independent projects, Syriana and Goodnight and Good Luck. Part of the problem may be that details of the corporate crime at the heart of the film are too sketchy to support the superstructure of the drama. Perhaps it is that Clayton himself is more a collection of random pathologies – gambling addiction, money problems, broken marriage - than an integrated personality. But Clooney’s shoulders are broad enough – in fact his whole body is broad enough as it bulked out for the role – to carry the film, and he is supported by three stunning actors – Tom Wilkinson, Tilda Swinton and Sydney Pollack. All four are corporate lawyers giving a modern urgency to Shakespeare’s cry “let’s kill all the lawyers”. Wilkinson is a top-notch litigator who has been fighting the corner of agrochemical corporation U-North, in a class action brought against them by 450 farmers claiming poisoning by one of their products. And he has fought it over 30,000 long, billable, hours. Pollack is his boss at law firm Kenner, Back and Leeden, desperately trying to fight off a takeover from a London-based legal giant. 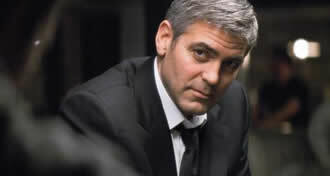 Clooney is the firm’s back room fixer. A former assistant DA, his street wisdom, cool head and excellent insider police contacts make him ideal for the role he describes as the company janitor– taking out the trash and cleaning up the mess left by clients’ more private transgressions. Nothing he deals with ever sees the inside of a courtroom. Tilda Swinton is breathtaking as U-North’s in-house counsel, a woman who has sacrificed so much to her career there is little left but a brittle shell. In one scene, peering at herself in the powder room mirror, her eyes shrunken with fear and her expensive blouse stained with sweat, she rehearses her lines for the board meeting, including at the appropriate moment, an icy smile. Panic sets in when, on the eve of a successful conclusion to the U-North case, Arthur Eden [Wilkinson] is having a meltdown. Not only is he claiming to be Shiva, the god of death, but he also seems to have switched sides. He is rocking the boat, telling tales out of school and breaking out of the corporate straitjacket – quite literally when he disrupts a pre-trial meeting by taking his clothes off item by item. Clayton is sent to get him back under control, proferring lithium and platitudes, but Eden has moved on to another plane. And when it becomes clear that nothing is going to stop him, Karen Crowder [Tilda Swinton] employs some clean up specialists of her own to deal with the problem. In a coded exchange worthy of Harold Pinter, Crowder’s new hireling tells her “we deal in absolutes”. Clayton can’t save his friend, and nearly shares his fate, saved by a combination of luck and quick-thinking. He confronts Crowder in a final scene that may well win him an Oscar. “I’m not a guy you kill,” he says. “I’m a guy you buy.” The film is written and directed by Tony Gilroy, screenwriter for the Bourne trilogy, and here a first-time director, working very effectively with director of photography Robert Elswit (nominated for an Oscar for his work on Clooney’s black and white Good Night and Good Luck). The plot cleverly retraces its steps in flashback from an explosive beginning. Particularly memorable is a scene redolent with symbolism, where Clooney, gaunt with tiredness, drives along a wintry road in the early morning. Stopping to watch the sun rise he climbs the hill and is confronted by three horses, their breath freezing in the crisp air. They allow him to approach and he gazes in awe at their beauty. It is like a verse from one of Robert Frost’s New England poems. Then, shockingly, on the road below his car explodes into a ball of fire. Sydney Pollack was nominated for an Oscar for his depression era drama They Shoot Horses Don’t They, and he is one of the liberal giants of Hollywood. Having him on board not only as an actor but also as producer, underlines Clooney’s aspiration to make films that show America a mirror image of itself, and challenge the status quo. 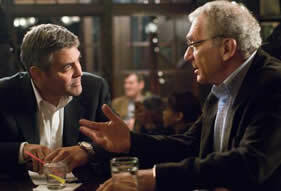 Overall, Michael Clayton is successful in achieving that.